Now start stringing until you reach about 60″. Then string a crimp bead, thread the wire through the guard, and back through the crimp bead. AND …you’re done ~ well, almost. You now get to attach your charms. Below I’m giving you a few more ideas for color combinations. 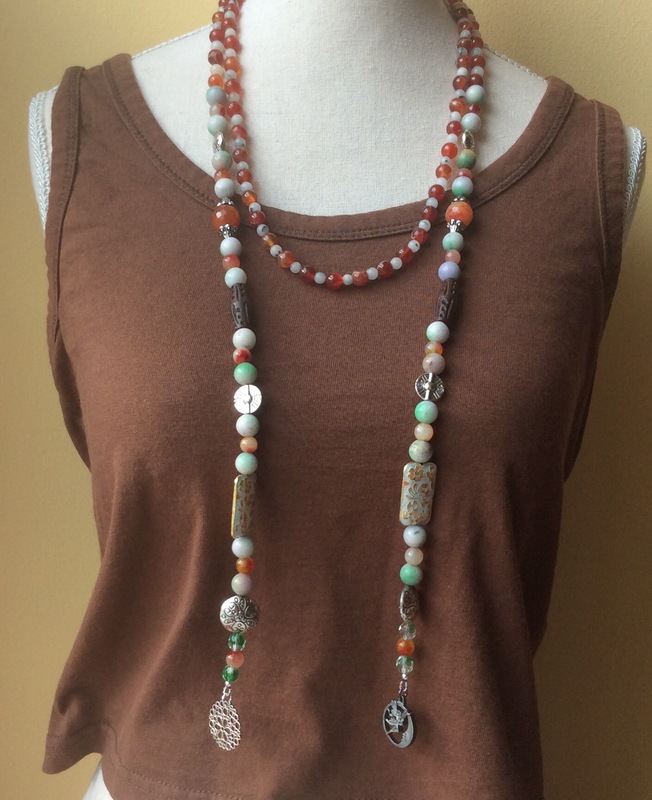 Or you can make a fun multi-colored one, or just use one type/color of bead. You see, the possibilities are (almost) endless! 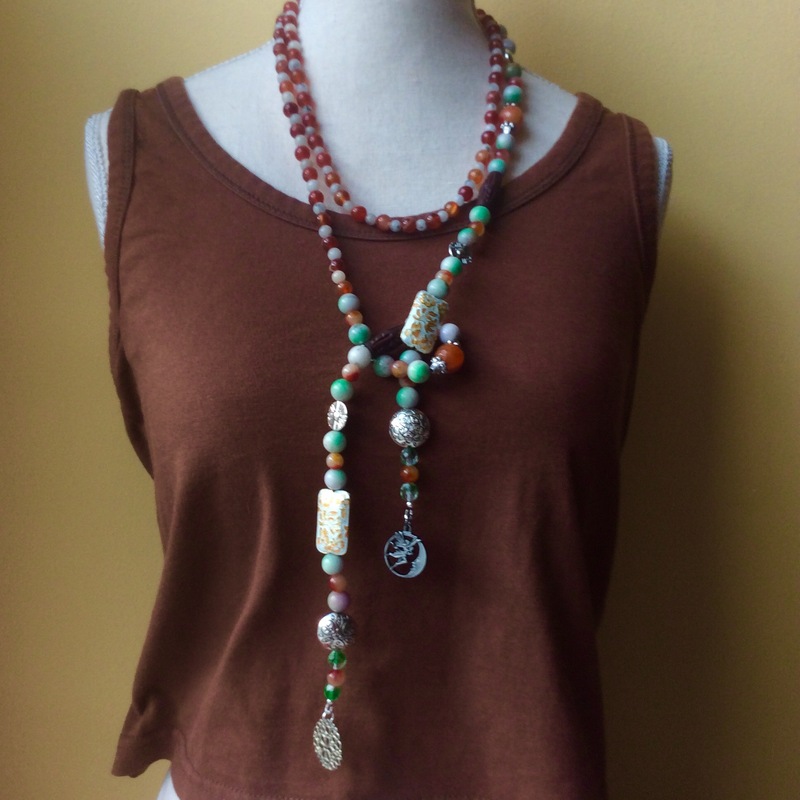 If you don’t like the typical Lariat look, simply attach a pretty clasp on one side, and a 10mm Jumpring on the other. 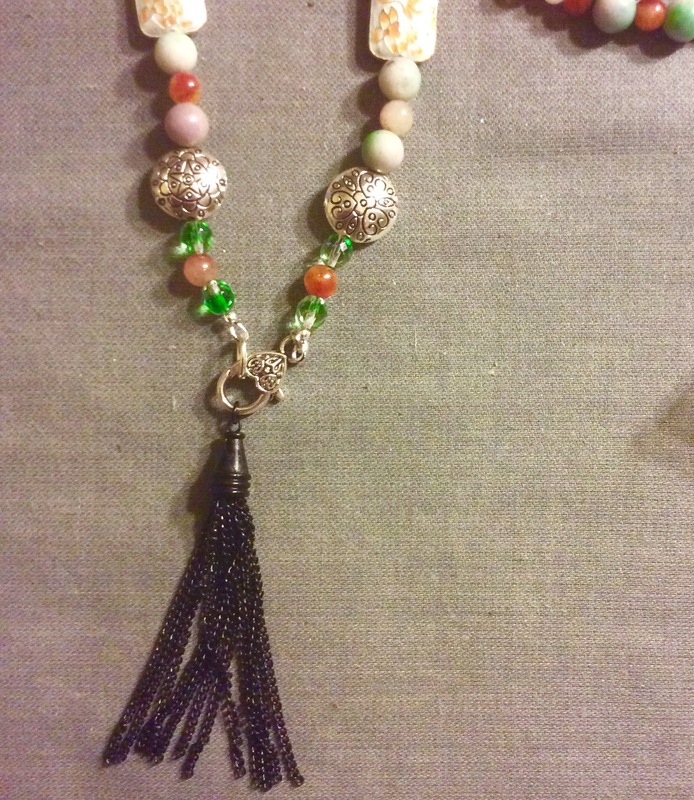 The charm (or a nifty tassel) will spruce up this design. Have fun designing, making, and-most of all- wearing your unique lariat. I hope you’ll show me your finished pretties! 😊 Questions? Please don’t hesitate to ask! 1. First you take the 4 strands of silk cord, fold them in half, and attach them, with a Lark’s head knot, to one of the freeform rings. Then you start braiding. 3. Take the ends, and thread them through the 2nd freeform ring. Fold the ends over, and wrap everything with the 12″ piece of wire. Attach the large link chain to the ring. Thread the beads onto the short pieces of wire, and form loops on both ends. 5. Take 3 small chain links, and connect the beads. Then, with 3 more links, connect the strand of beads to the top of the pendant. 6. Now connect the last bead to one part of the toggle – using the medium (chain)link, and the other part to the large-link chain. You’re done! 🤗 Look at it! You did this! 💕 Congratulations! I hope you had lots of fun with this project! Of course I’m – as always – looking forward to seeing your finished Necklace! Last week I taught one of my jewelry making classes. Everyone had a blast and loved the end-result! 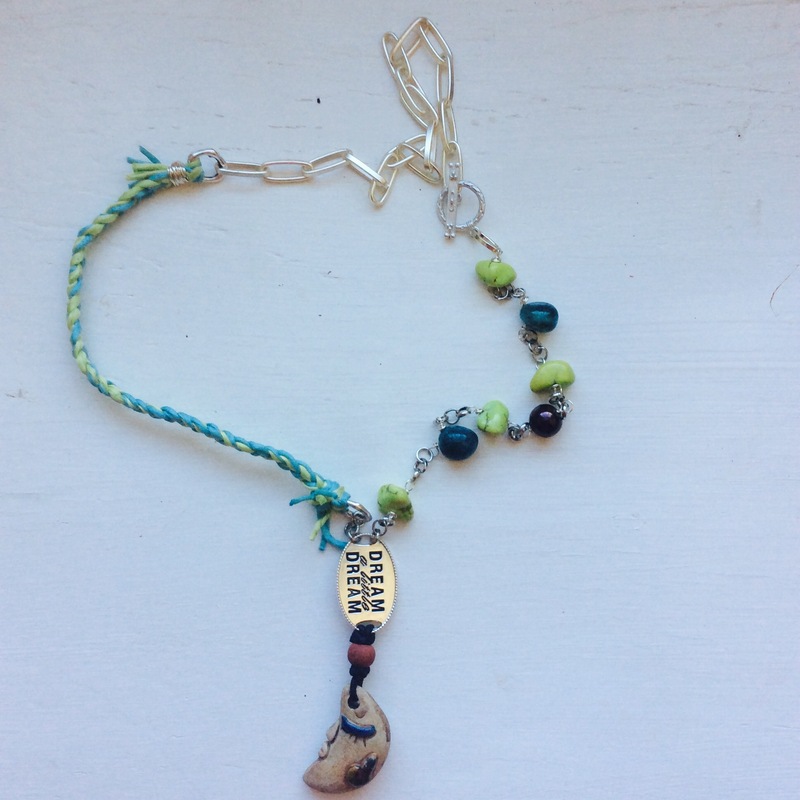 One of the reasons, besides the pride and joy of finishing a piece of wearable art, was the fact that the girls could design their own, pick their favorite charms and beads and incorporate these ideas. So I decided to spread the joy even further 🤗 with this post and the kits I created that I will offer on my website. 1 } Look over your bead and charm selection, and decide on the design. Thread the beads onto the pins; take a chain link and attach it to the charms. 2} Now, using your round-nose pliers, form wrapped loops – either connect it to the loop of another pin, or use a chain-link to connect the two. …and attach the charm to the hoop. 5} Use one chain-link to connect the hoop to the 10mm Jumpring, fold the cord in half, thread the cord through the jumpring, and form a lark’s head knot. I’d love to see pictures of your finished piece! I hope you had fun…Keep on beading! Are you looking for a fun project? How about this necklace? 1. Start by threading a beadcap and a bead onto a headpin. Make a double-wrap loop using the round-nose pliers, then attach a jumpring. Repeat for all 12 beads. 2. Take a 14″ length of wire and fold it in half. Take all 3 (6) strands and place it in the loop. Adjust the strands so they extend appr. 1/2″ below the wire. Twist once. Use one end of the wire to wrap tightly around all strands. Like so…. Now form a double-wrap loop with the other end, and either clip it off or use it to cover any spaces you might have in the coil. 3. Use all strands to make an overhand knot about 5″ from the coil. Form an overhand knot using all strands about 1″ from the previous knot. 5. Use 1 (3) strand(s) to string the pendant. Repeat Step 4 in reverse. 6. Use the remaining 2 jumprings to attach the toggle clasp. And you’re done! 🤗 Congratulations! 💕I’d love to see some pictures! Need more help? Please holler! I’m happy to answer any questions you may have. I hope you have fun making this beautiful piece! Don’t forget to send me some pictures! I just had a ‘meh’ – moment – I hope you don’t mind me telling you about it real quick! Now in theory I know how this works (should work!) But somehow I see a lot of doing and undoing in my nearest future 😂 I’ll let you know! 2. I’m planning a longer blog-post (hopefully with an interview) about my visit to the National Silk Art Museum in Weston, MO. I visited Mr. John and his museum last Saturday (it’s just a skip and a hop up the street from my shop) What an amazing place! I didn’t know what to expect – for some reason I pictured silk panels, and -paintings. Boy, was I wrong. There you can find the most amazing collection of antique silk weavings. Until then I didn’t even though these pieces (and artform) exist(s). Mr. John is the founder and curator, he finds, cleans, and frames these beautiful pieces. He doesn’t charge admission, but accepts donations. I decided to help out a little. 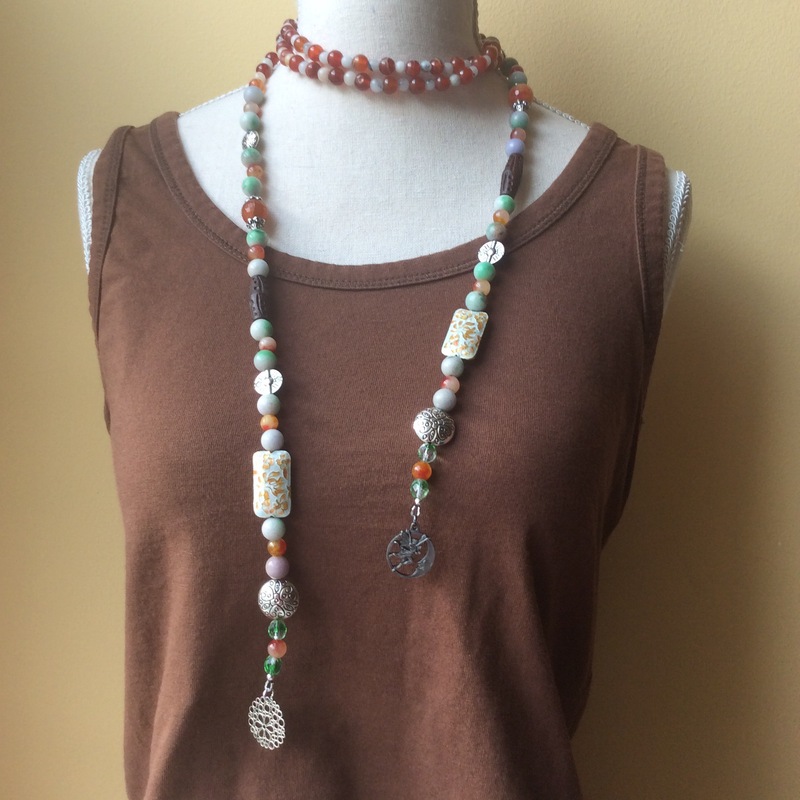 I designed a necklace – with silk fringe, of course – and a large portion of the sale of each necklace I will donate to the museum. There is something about these dainty creations that fascinates me. When I look at one, I can see the black shadows of nightmares getting tangled in the net, while the airy and happy dreams slip through the hole and slide down the feathers to the sleeper. Dreamcatchers originate with the people of the Ojibwe Tribe. Through intermarriage and trade they were later embraced by neighboring nations. Ancient tales of the Ojibwe people speak of the children’s caretaker, Spider Woman, known as Asibikaashi (the inanimate form of the word for spider of the Ojibwe people is ‘asabikeshiinh’) She is said to have taken care of all the children and people on the land. As the Ojibwe nation began to fan out and settled all over North America, it was difficult for Asibikaashi to protect all the children. The mothers and grandmothers started weaving magical webs, using willow hoops and sinew, and would hang the charm above the cribs and beds to protect the wee ones from nightmares. And so, thanks to Asibikaashi, and the mothers and grandmothers of the Ojibwe people, we get to enjoy these beautiful charms and are blessed with their protective powers.